Repeat fees can play a big part in an actor’s salary. 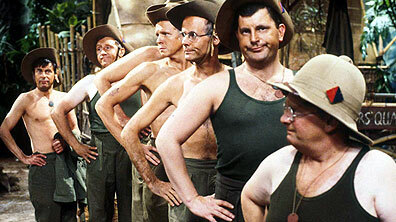 How do you feel about the BBC refusing to repeat Perry and Croft’s wartime sitcom, It Ain’t Half Hot Mum? It was one of the most popular shows on television and I don’t understand the decision. Now, people can swear on television – which we never did – and you’re seemingly allowed to tell any homophobic joke you want, et cetera. Yet because Windsor Davies’s character called us a “bunch of poofs” and Michael Bates, who was born in India, dressed up as an Indian, the BBC won’t repeat it. It’s sad. The writers, Jimmy Perry and David Croft, tried everything they could to get the BBC to repeat it but to no avail. Melvyn Hayes in the Sunday Telegraph's Fame & Fortune Q&A. 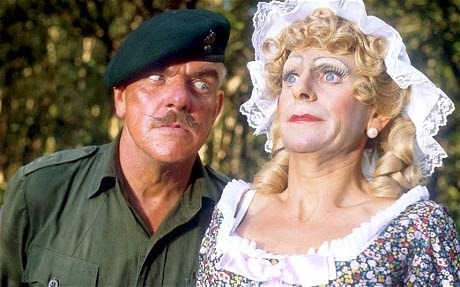 Melvyn played Gunner 'Gloria' Beaumont, a drag performer in a soldiers' concert party stationed in India and Burma during World War II, in the bafflingly popular BBC TV 70s sitcom. He has a passion for show business and always dresses up as famous film stars during the concert party shows, especially as Ginger Rogers. Gloria is an enormous coward. He is known throughout the company as being camp if not homosexual. This is seen in one of the episodes where Rangi says "Bombadier Beaumont is...." and makes the limp wrist gesture symbolic throughout Britain as meaning gay. Muhammad says "Bombadier Beaumont is Flyswat???". To which Ramzan goes "(STRING OF URDU/HINDI) Homosexual". To which Rangi says "Stop being such clever dicky." Wiki. And that's what passed for top comedy back then - and may explain why it's not repeated these days. One scene that had me in stitches on IAHHM was when Windsor Davies had them quick marching and he was shouting " YOU ARE A LOAD OF POOFS! WHAT ARE YOU?....WE ARE A LOAD OF POOFS! a hate preacher was venting his vile opinion so I felt I was just in venting mine against him. I soon received an email threatening action against me and my ISP if I ever tried to post on the Mail and other papers in the group. Too hate filled for the Daily Mail. Congratulations!